When visiting restaurants, you will often be offered a selection of breads, which invariably include a dark brown breads When they are presented at the table …. confession time… the first thing I do is have a taste and try to guess the ingredients, in the hope of recreating them at home. I know I could politely ask Chefs for their recipes, but I like to take various elements and try to come up with one of my own, which will work in a domestic kitchen (and oven). 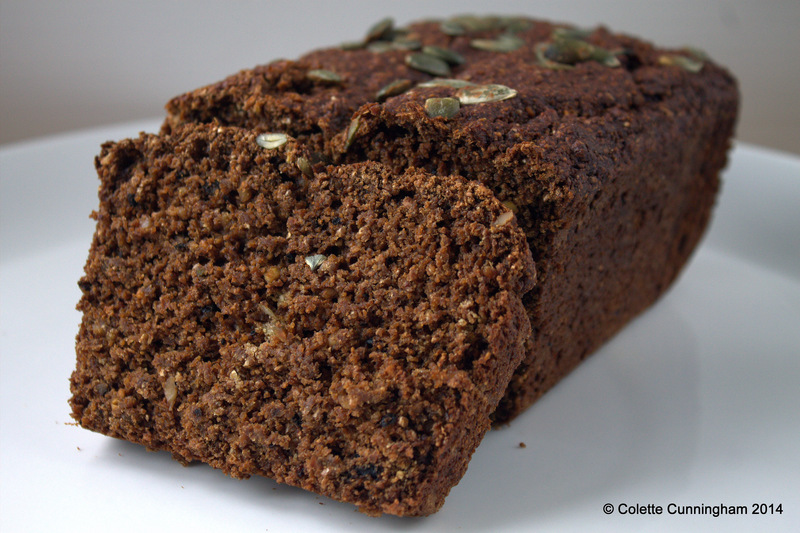 On a recent visit to Restaurant 1826 Adare, we had the most delicious brown bread. So, in deference to Chef/Patron Wade Murphy (and I hope he will forgive me) , and the team at Restaurant 1826 Adare, here is my version of the Stout Brown Bread we enjoyed during our visit. Pre-heat your oven to Gas Mark 3, 325°F/170°C, and line a 2lb loaf tin with a paper liner, or grease with butter and flour your tin. *When blitzing the walnuts and pistachios, leave some texture, and don’t blitz to a powder. Tip: Fill a tea-cup with boiling water, and dip in your teaspoon before scooping out molasses from a jar, it will slide off with ease. Place all the dry ingredients into a large bowl and mix to combine. Add the butter, and rub this in with your hands. Add the buttermilk, molasses, and Guinness, and mix thoroughly. Scrape the dough out of the bowl with a strong spatula into your baking tin, flatten with an off-set palette knife, or flat kitchen knife, and top with the Sunflower seeds. Bake for 20 minutes, then turn the tin around, and bake for a further 20 minutes. Test with a skewer, and, if you find it has not fully cooked through, bake for another 5 minutes, turn again, and finish with another 5 minutes. Leave the loaf in the tin for 10 minutes before removing, and leaving on a wire rack to cool completely. This bread is more suitable for eating before dinner, with some butter, or as an accompaniment to a Gouda style cheese and a chutney. Lovely loaf! The addition of the nuts is very interesting. Thanks Conor, plenty of flavour and texture.